At no time will all of you get a good night's sleep...you will either be awakened frequently by children, have to work until the wee hours of the morning, be unable to stop thinking of what you have to do the following day or the theme song to Sophia the First will run on a constant loop in your head making you want to drive a pencil through your eye. Now, I have never been one of those people who can sleep the day away (except for college of course). I am a morning person, and don't mind getting up early - if I have had my 7-8 hours of sleep. I neeeeeed that 7-8 hours or I turn into something like The Beast from the movie Krull (please tell me someone else that reads this blog knows that movie, besides you mom!) and you don't want to be messing with the beast. She will bite your head off for looking at her sideways (sorry hubs). Before sweet baby Val came into the world I was sleeping 8-10 hours a night. Miss M has always been a champ when it comes to sleeping. 3 hour naps every afternoon - like clockwork. Never woke up in the middle of the night, never came into our bed...let us all get our much needed sleep. Then Val graces us with her presence, and things take a drastic turn. Of course you don't sleep when you have a newborn: that is par for the course. But not only was I not sleeping, I had a baby who would not let me put her down at all throughout the day. She slept on me for naps and throughout the night, and if you have ever had a baby sleep on you, you know you are not sleeping - you are more like resting your eyes. It was like that for the first four months of Val's life. It wasn't until January that we actually moved her to her crib to sleep on her own. And since then we have gotten a handful of nights were she slept through the night, but most days she gets up once for a bottle. During the day is a different story all together. I am lucky if I get a 30 minute stretch out of Val. She will sleep for 5 minutes here, 10 minutes there, in the car, or fall asleep during tummy time. I have tried everything to make her nap time more successful: doing the bedtime routine during the day, white noise, blackout curtains, change of temperature, different clothing, different sleep sacks, etc. Whatever the equation the sum does not equal a good nap! We have just come to the conclusion that she won't be the day-sleeper her sister is, but at least we are getting good stretches at night...until the last week when she started rolling over! And apparently her sister and her have a deal to allow us to never have a good night's sleep again (see above for unwritten house rule). Since M is now fully potty trained she is getting out of her bed at night to use the potty - which means she is running down the hall to our room and either standing like a child of the corn in our door way and saying "i need to go potty now," or coming to my side of the bed and poking me constantly in the back and saying "mom! Mom! Mom!" 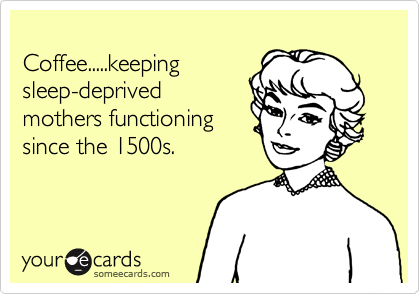 I have become a coffee drinking strictly because at about 9 AM every morning I am struggling to keep my eyes open - which is a job requirement for a stay at home mom. Sure I might be getting 7 hours a sleep, but in 3-4 hour increments, and big gaps in between because lately I have the hardest time falling back to sleep after getting up with the girls. Last night I was up with Val from 1-1:30, but was wide awake in bed until 3:30 thinking about everything from selling our house to watering the plants. I could not shut my brain off! Damn you brain! And of course right when I fall asleep around 3:30 what do I hear? That was when I tagged in hubs for a round. All I want is 8 hours of uninterrupted sleep. No monitors, No potty breaks. No night time feedings. I think at this point I might cut off a toe for a good night's sleep. I haven't slept in five years, so I feel your pain! I called in a sleep consultant and she recommended that I use a sticker chart and a stoplight clock that has a red light until it's time to get up and then it turns green...that actually worked for a while, but now Honey (who is the real criminal mastermind here) doesn't get out of bed - so she technically gets a sticker - but will call me across the house so I have to dash over to see what she wants and keep her from waking everybody else up. Ugh.